Junior research scientists (all disciplines) from academia and industry, particularly those starting to present their work at conferences and seminars. It is also useful for scientists who want to present technical material to companies or investors. Our one day course, unlike many presentation skills courses, is designed specifically for the practising scientist. We cover all aspects of verbal scientific communication, asking delegates to present their own research in a conference format prompting feedback on style and content. Because of our expertise in both science and communication skills, we help to solve common problems (such as nervousness and voice control), as well as those unique to scientists presenting the results of their research. The day begins with practical instruction on key topics associated with slide content and the process of verbal delivery. Each delegate is then asked to deliver a short scientific presentation with digital slides and to answer questions. The whole process is filmed and played back to highlight positive aspects of delivery style and talk content, as well as to identify areas that require improvement. We usually recommend that a maximum of ten delegates attend each session to ensure that each individual gets as much attention as possible. The trainers Ed Zanders and Lindsay MacLeod have written Presentation Skills for Scientists - a Practical Guide which delegates will receive at the end of their course. We also conduct one-to-one training in situations where an organization wishes to prepare an individual scientist or engineer for an important external meeting or conference. 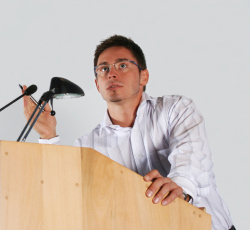 These sessions employ similar techniques to those used in the group courses but are completely focussed on one individual and their presentation. Presentation Skills for Scientists can be organised by direct arrangement between PharmaGuide Ltd and companies or university departments who wish to host the course in-house or at an offsite location. In all cases, prices are negotiable. We have run the course for units of the Medical Research Council, the National Institute for Biological Standards and Control, One Nucleus (formerly ERBI), Oxford Biotechnology Network (OBN), as well as for scientists in high technology companies. Most people recognise the importance of good communication skills, and sadly these may have to be employed in the search for new jobs after redundancy. We have already run the course for an organisation that was closing down its research centre but wanted to give its staff the best opportunity to find work elsewhere. PharmaGuide has also contributed bespoke training, for example at the LyfeLyne meeting organised by Roche in Budapest, where clinicians were given training in presentation skills.